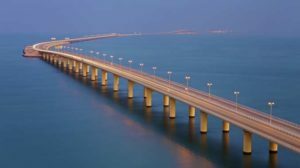 Construction of a 25km-long causeway between Bahrain and the regional power Saudi Arabia will kick-start mid2021, Saudi envoy to Bahrain has told media. The project, to cost between $3 and $4 billion, will be put out to tender end of next month, Abdullah bin Abdulmalik Al Shaikh reportedly said. Structural studies will take two years and a half while the project execution is scheduled to start by mid-2021 and will be completed three years after, Al Shaikh added according to media reports. The causeway will boost ties between the two brotherly countries, particularly in the area of trade. The project features four vehicle lanes and a 75km railway. Posted by KanelkaTagba on Sep 18 2018. Filed under Gulf News, Headlines. You can follow any responses to this entry through the RSS 2.0. Both comments and pings are currently closed.